Cheddar cheese, potatoes, and a little bit of bacon for good measure — what’s not to love about this creamy, Cheesy Potato Soup? Chances are you’ve experienced the comforting duo of cheese and potatoes a time or two — even with bacon and scallions. It’s no surprise that these familiar flavors also make a super soup. 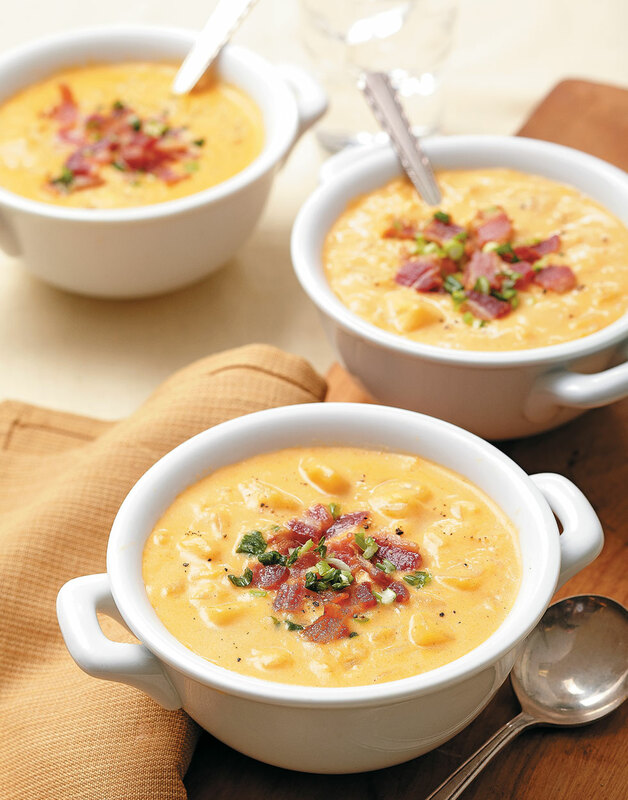 A hint of Tabasco sauce adds a spicy kick to Cheesy Potato Soup. Use more or less depending on your preference. Stir in flour and cook 1–2 minutes. Add potatoes, dry mustard, and paprika; cook, stirring to coat potatoes, 1 minute. Stir in broth, Worcestershire, and Tabasco. Bring to a boil, reduce heat to medium-low, and cook, partially covered, until potatoes are soft, 10–15 minutes. Coarsely mash potatoes, then stir in Cheddar and half-and-half until Cheddar is melted, 2 minutes. Remove soup from heat; season with salt, black pepper, and cayenne. Top servings with bacon and scallions. Cook diced potatoes in broth until they’re soft. Slightly mashing them adds body to the soup. Add cheese and half-and-half near the end of cooking. Remove soup from heat once the cheese melts.